Drift allows you to easily create a playbook to target specific visitors on your site. Depending on your Drift subscription, you may or may not have the LeadBot functionality to automatically schedule meetings on behalf of your reps.
We've found a quick hack to help make this work for Drift + Chili Piper customers. We suggest you create a playbook in Drift. Let's use our "LeadBot Pricing Page" as an example below. Create an end goal and insert + hyperlink your Chili Piper booking links....ex: When a qualified lead hits our end goal of "< 10 Sales Reps - Qualified" we send them this booking link: https://calendar.chilipiper.com/book/less-than-10-sales-reps to have them schedule a meeting with our sales team. 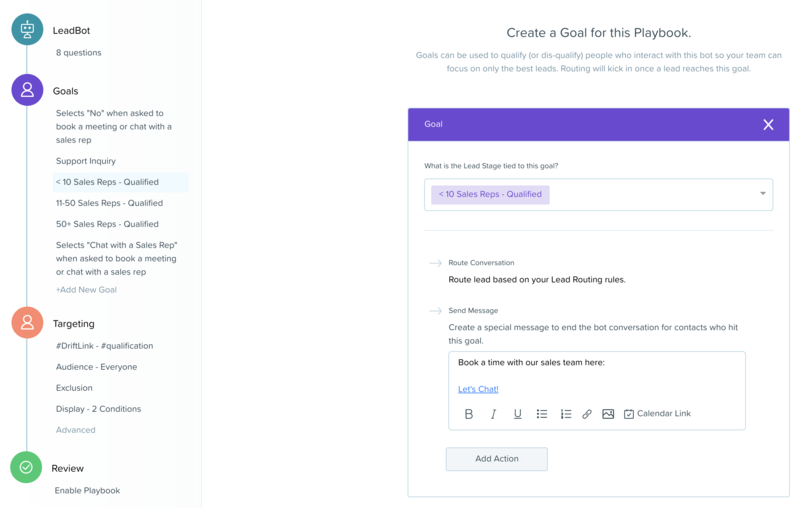 Publish your Drift playbook and enable your Drift LeadBot to schedule meetings for you when your team is off working hours. The meeting is automatically created in the assignee's calendar and the prospect gets invited. The meeting is displayed on the prospect calendars. You can create advanced rules and send your prospect an email, reminders before the meeting, and much more. 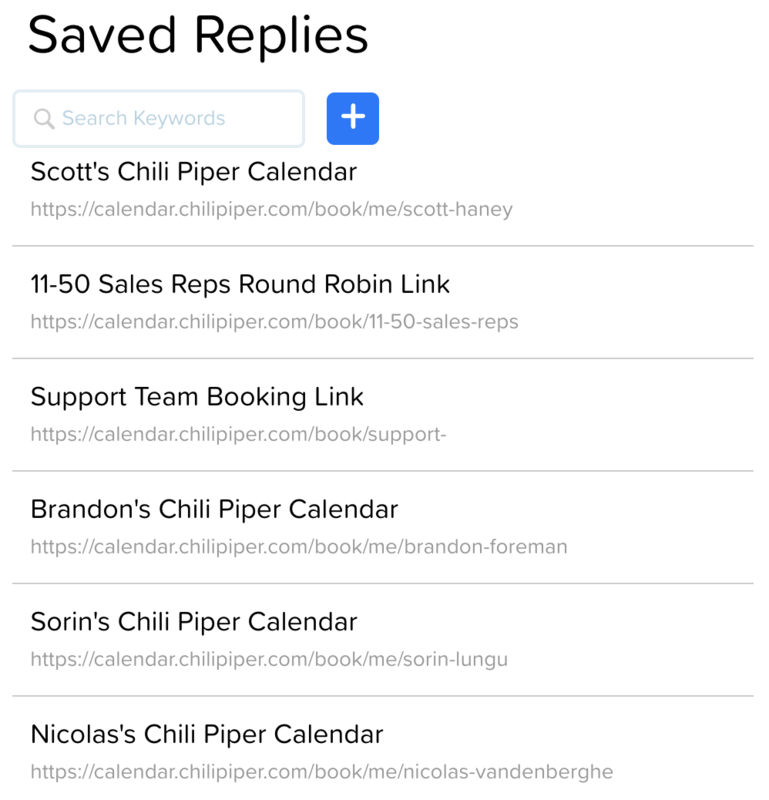 With Drift, you can send and store Chili Piper calendar URLs from saved replies. To access saved replies within Drift you must currently go to the team settings >>> conversations >>> saved replies. Within the conversations tab in Drift, you can access and insert saved replies as you chat with prospects or customers. - For Prospects, quickly insert your public booking url or a team calendar link to ensure the meeting is passed on to the correct sales rep.
-For Customers, simply click to insert a calendar link to your customer success or support team to help schedule meetings with customers who may need help with your product. Drift recently released their Sales Cadences. 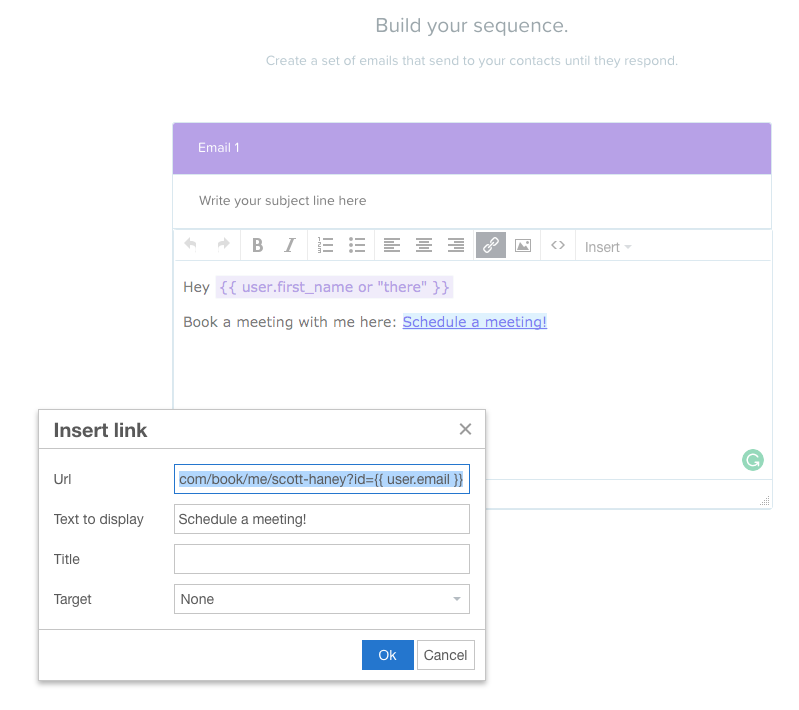 Within your email campaigns, you can send specific calendars URL to your prospects that can drastically increase your conversion rates because prospects can book meetings in one click.